Reviewed in full: the new Panasonic Lumix G7, featuring advanced 4K / 8 megapixel photo shooting and 4K video recording. 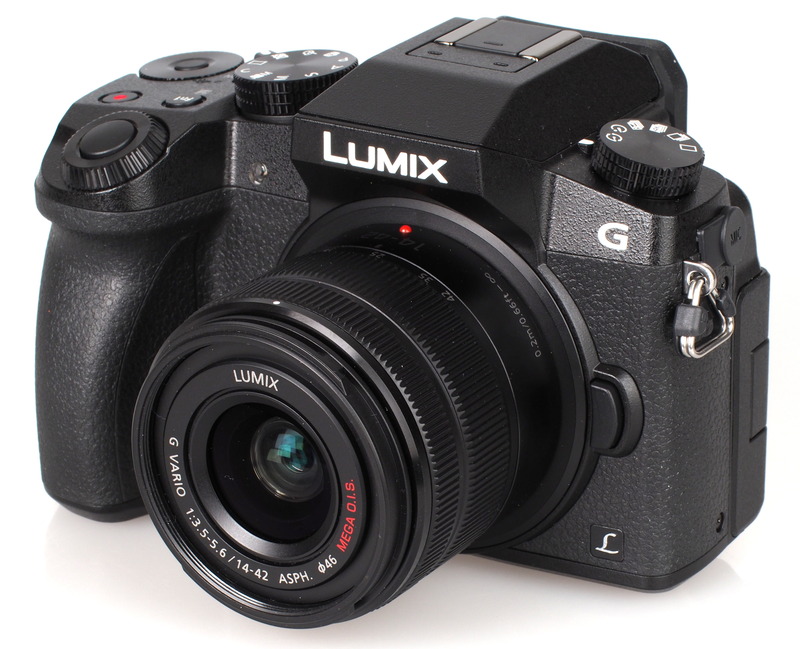 The G7 is the new Digital SLR-styled mirrorless camera, or DSLM (Digital Single Lens Mirrorless) as Panasonic like to call it, and features a 16 megapixel Micro Four Thirds sensor, capable of shooting 4K video and photography. It is the 5th digital camera model from Panasonic to record 4K video, after the GH4, FZ1000, LX100, and CM1, and is designed to bring 4K shooting to everyone. 4K Pre-burst - records 30 frames the second before and after the shutter is pressed giving you 60 chances to capture the perfect moment. You can save 4K photos straight from the camera, without having to process the video files on your computer. Lightroom can also be used to select frames from the video. 4K video is useful as it can also be used to create 1080p video, to either crop for a 200% view, digitally stabilised or reframed, amongst other things. The Panasonic Lumix G7 features a new and improved multi-process noise reduction system, this applies noise reduction and detail processing based on the specific environment and conditions of the shot. 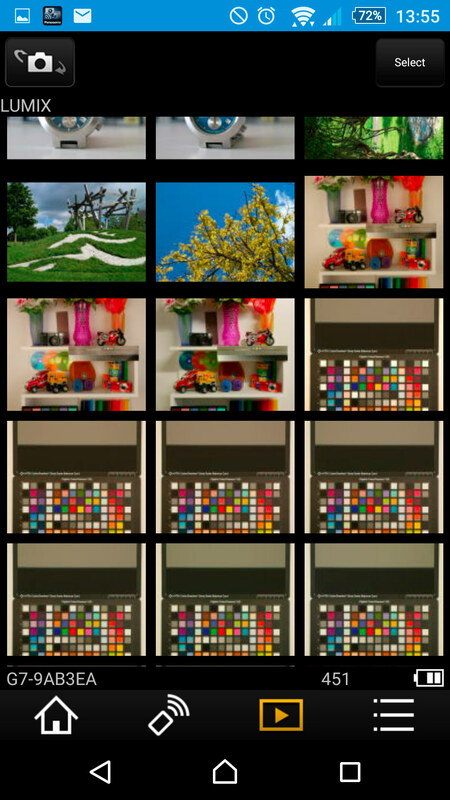 A new "Random Filter" granulates chromatic noise and blends it into the image for natural looking shots. The ISO range starts at ISO100 and goes up to ISO25600. As well as being able to shoot 4K Photos at 8 megapixels at 30fps, you can shoot 16-megapixel images at 8fps, of 6fps with continuous AF enabled. The camera features "Low light AF" which will focus in light as low as -4EV, and the camera includes "Starlight AF" - which Panasonic say allows you to capture individual stars and constellations in the night sky! 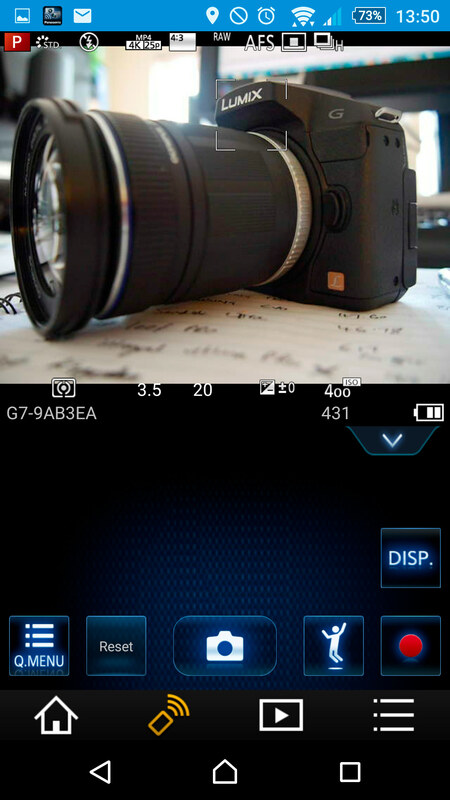 The camera also features High-speed AF and DFD (Depth From Defocus) technology lets the lens focus quicker. 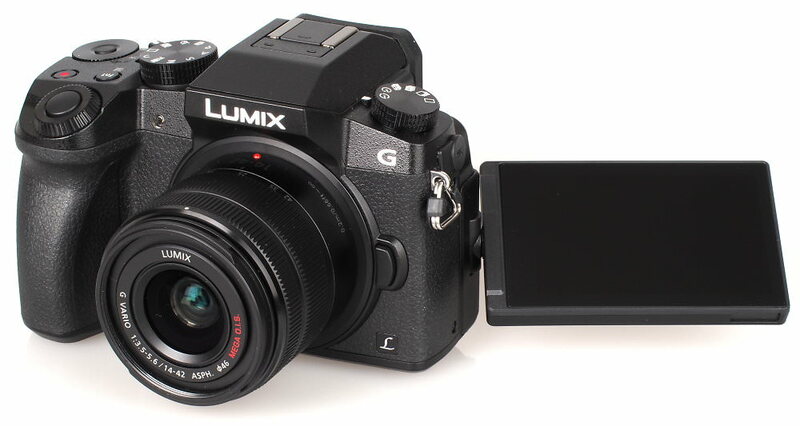 The camera has a more angular design and is larger than the Panasonic Lumix G6 which it replaces, as well as being heavier weighing 410g with battery and memory card. The camera now features front and rear control dials, with the rear control dial featuring a middle button which can set the front and rear control dial to change ISO and WB, this can also be customised. The camera features a large rubberised handgrip that surrounds the side of the handgrip, with a rubberised thumb grip at the back. The left side of the camera is also rubberised. A drive mode dial can be found on the top left, a flash hot shoe, and above this, stereo microphones. 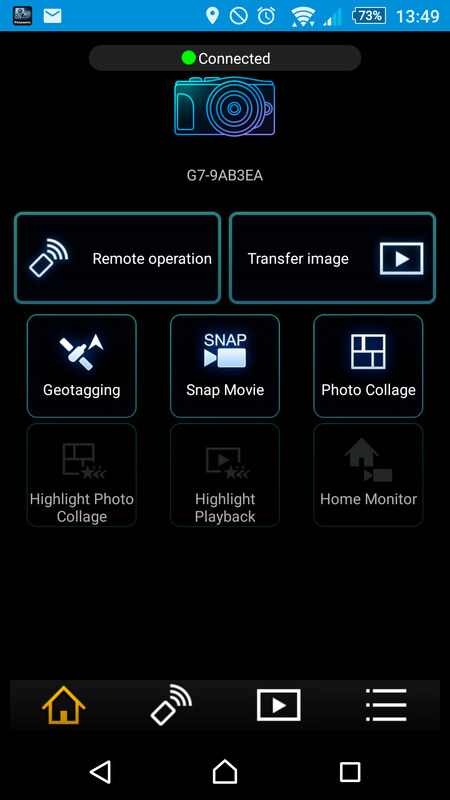 the mode dial features P/A/S/M, iAuto, Creative shooting, scenes, panoramic, Custom and Manual movie mode, an on/off switch, exposure compensation / Fn1 and video button. 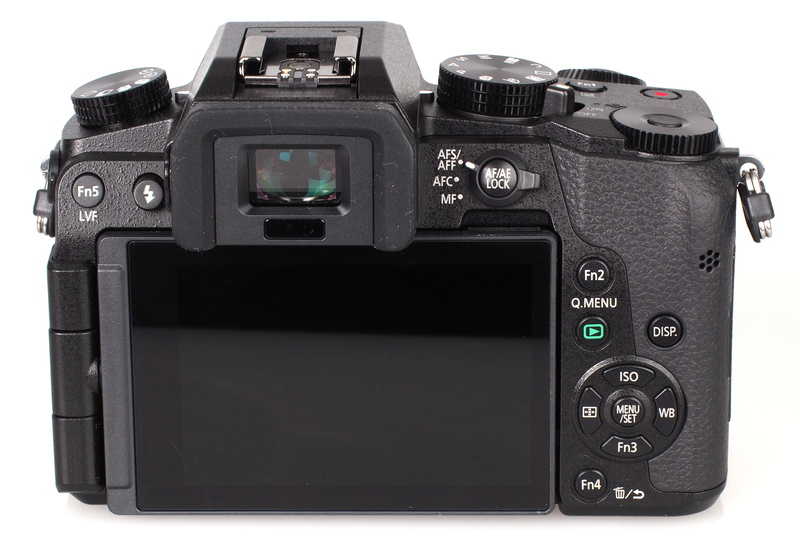 The touch-screen can be used to set the focus position, as well as change settings on the camera quickly using the Q. menu button. You can use the touch screen to set the focus position while the camera's electronic viewfinder (EVF) is held up to your eye, although this can also mean that you accidentally set the focus point with your nose. Luckily this feature can be switched off if necessary. The eye surround has been improved over the one featured on the G6, and is now tougher and larger. There are multiple menu options and settings, spread over several screens, with the camera displaying hints and tips for each option making it easier to use without having to refer to the manual. A video showing all of the menu options can be found on the ePHOTOzine YouTube channel. Built-in Wi-Fi allows you to remote control the camera, as well as transfer images to a smartphone or tablet. Although, unfortunately, the camera does not feature NFC. Jump mode uses your smartphone's motion sensor to detect when you have jumped and is designed to get a photo of you in mid-air. 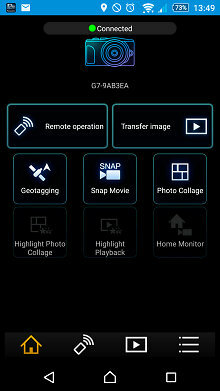 You can also use the app to add GPS data to your photos. 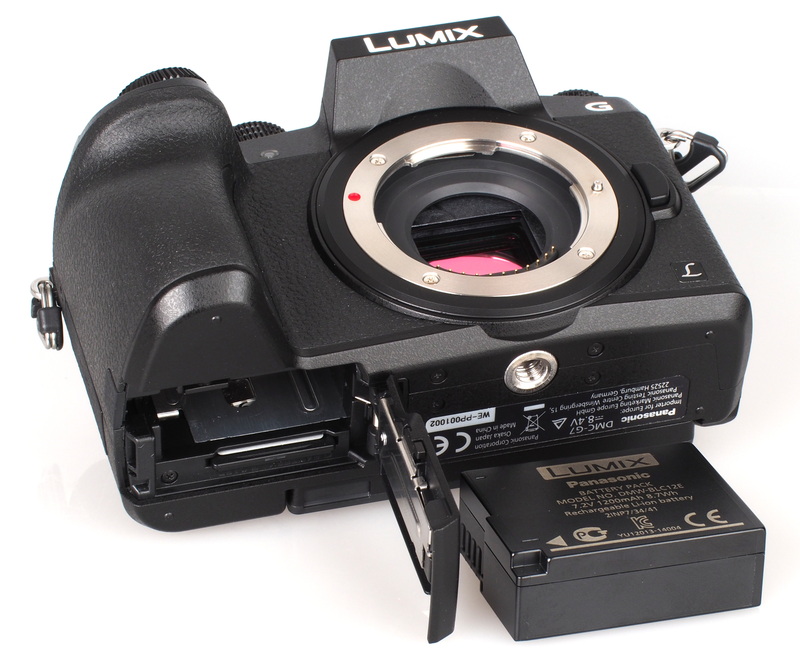 Battery life - Battery life is rated at 350 to 360 shots according to Panasonic / CIPA test results, depending which lens is used with the camera. The G7 uses the same battery as the G6, but gives better battery life. The battery and memory card compartments are underneath the camera. Extended use of the 4K pre-burst mode and Wi-Fi is likely to reduce battery life. Focus and shutter response are both excellent, and the camera has a quick shot to shot time. Continuous shooting is quick at just under 8fps, and you can take a good number of JPEG and raw images before the camera slows down. We tested with a 16GB SDHC UHS:I U:3 card, although the camera will take UHS:II cards as well. Sample Photos - Portrait photos with flash show no red-eye, and skin tones are quite good, although flash has made the skin redder in this portrait photo. The camera has face and eye detection, so that the focus point will automatically be on the subjects eyes. Dynamic range is good, and there are options to expand dynamic range, using the iDynamic setting, Highlight / Shadow settings, or using the HDR shooting mode. You can adjust picture settings, including contrast, sharpness, noise reduction, and saturation. When shooting in the monochrome mode, there are options to set a black and white filter (Yellow, Orange, Red, Green). Exposure is reliable with the camera performing well the majority of the time. Lens Performance - The 14-42mm kit lens performs well and is quite resistant to flare, even when the sun is in the frame, with the provided lens hood providing additional protection from flare. There is minimal barrel and pincushion distortion as the camera automatically corrects for this in camera. There is some vignetting visible when shooting at the wide-angle end of the lens, however this can be corrected in camera by switching on "Shading Compensation". Very little chromatic aberration or purple fringing was seen. We were disappointed by the macro performance of the lens, as the closest focus distance of 20cm doesn't let you get very close to the subject, and for better macro shots a different lens is recommended. ISO Noise Performance - Noise performance is good up to ISO3200, with the camera producing usable results. At ISO6400 and ISO12800 noise increases, but instead of red, green and blue dots, the camera cleverly deals with noise, creating an image with a grainy appearance, whilst still recording better than expected detail and colour. At ISO25600, this grain increases, and there is a slight drop in colour saturation, however results are looking promising. The camera focuses well in low-light, and will use the built in AF assist light if needed. Results are comparable to the E-M5 Mark II, and significantly improved over the G6, with ISO25600 looking much better. At the lowest ISO setting of ISO100 (extended) dynamic range is lower, and by default the camera shoots at ISO200. There are options for vignetting / shading compensation in camera, as well as diffraction correction. For these images, this was left switched off. 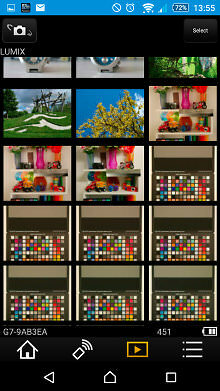 White Balance Performance - Auto White Balance (AWB) performs gives a warm colour cast under tungsten lighting, with the tungsten preset giving a more accurate result, although it is still quite warm, and for better results custom white balance is recommended. AWB performs reasonably well under fluorescent lights, with a slightly warm result, and again, for better results custom white balance is recommended. 4K Photo modes: Using the 4K photo modes is straightforward; simply turn the drive mode dial to the 4K photo setting. You then have three options, 4K burst, 4K Start/Stop, and 4K pre-burst. Each of these will record a 4K video at 30fps, from this you can then go through frame by frame choosing your favourite image and saving as an 8 megapixel JPEG. If you use this feature a lot, then going through the photos can take a while, as unlike other cameras with this kind of feature (such as the Nikon 1 series), the camera doesn't automatically save the best photo(s) from the set. Panorama mode - The camera features an automatic panoramic mode (120°/360°), where you simply press the shutter release button and pan the camera from one side to the other. Results are very good, and well stitched together, with a high-resolution image produced. Digital Filters - Creative effects let you apply a number of digital filters to the images, and you can shoot JPEG and raw so that you can go back to the original if you want to. There is also an option to save the original, unedited JPEG image as well. The HDR mode takes a number of photos at different exposures and combines them in-camera into one photo. This produces good results with expanded dynamic range, and can be used handheld. Video - Video quality is very good, with lens based optical image stabilisation helping keep the video steady, even when recording hand-held, as shown in the video below, however for the best results a tripod is recommended. There are Snap Movie options, filter settings, highlight shadow options, diffraction compensation, luminous level settings, an improved mic level adjustment display (-12dB to +6 dB), mic level limiter (on/off), wind noise cancellation and zoom lens noise cut options. The camera records Dolby Digital sound (an improvement over the G6). 4K video options, recorded as MP4: 3840x2160, 25p or 24p, 100Mbps, AAC. Full HD 1080p video options include AVCHD or MP4 compression, with the camera offering AVCHD: 50p, 28Mbps / 25p, 24Mbps / 24p, 24Mbps, MP4: 50p, 28Mbps, AAC / 25p, 20Mbps, AAC and there are lower resolution options including 720p (at 25p), and VGA (at 25p). Additional sample videos can be found on the ePHOTOzine Youtube channel. 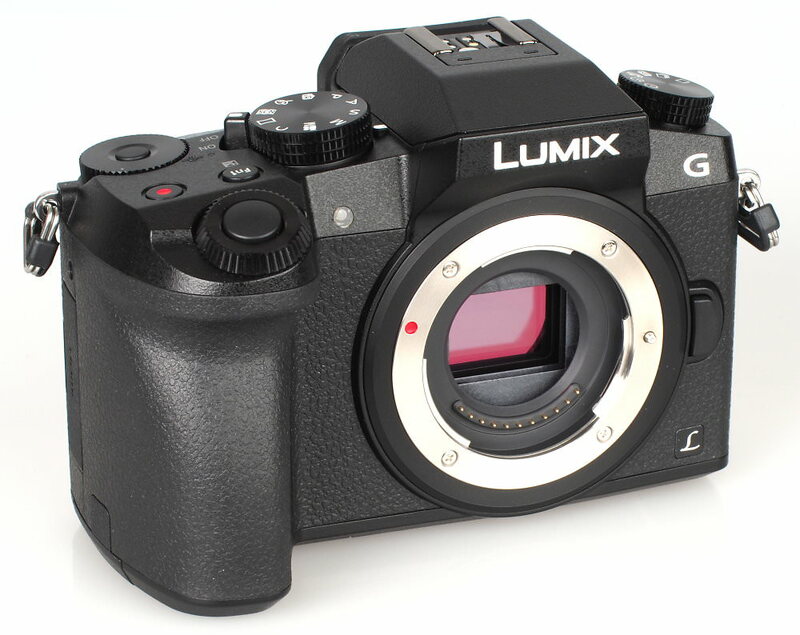 The Panasonic Lumix G7 is available for £599 body only. Priced in between the Olympus OM-D E-M10 (at £399) and the Olympus OM-D E-M5 II (at £899), the G7 offers compelling value for money, with additional features such as 4K video, it is more comparable to the E-M5 Mark II but at a noticeably lower price point. 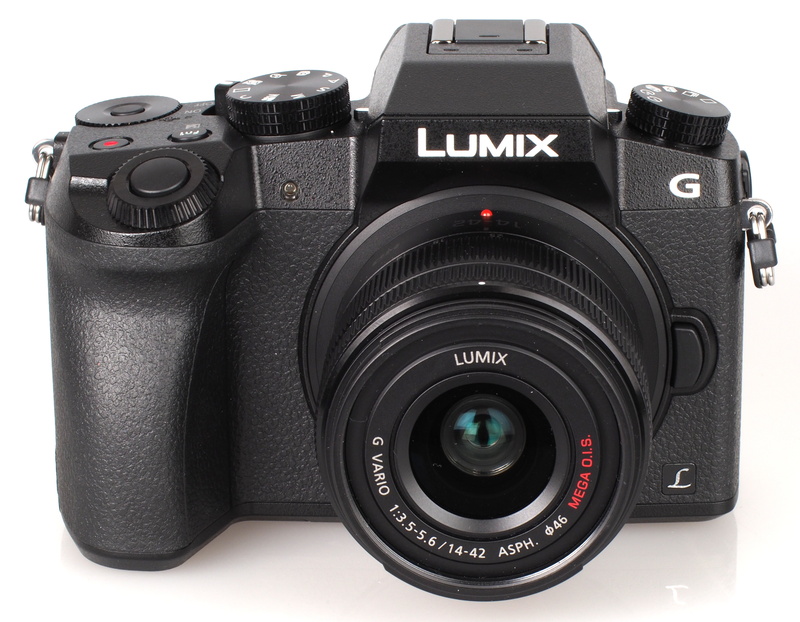 The Panasonic Lumix G7 offers an impressive range of features, including 4K video recording, a high resolution electronic viewfinder (EVF), rapid performance and focus speeds, as well as high image quality with a newly updated image processing engine. The camera makes 4K recording not just about high quality video, but makes it easy to capture photos at 30fps and then select your favourite 8 megapixel image(s) to save. The G7 delivers very good image quality, even with the starter 14-42mm kit lens, and optical image stabilisation helps get sharp shots and steady video. Noise performance is very good, with the camera competing with other Micro Four Thirds cameras, as well as some APS-C cameras. The design of the camera has been updated, and the camera feels more like a mini Digital SLR with ample controls to change settings. A vast array of Micro Four Thirds lenses and accessories are available making this an excellent system to buy in to, and the ability to record high quality 4K video is an added bonus that can be used for video as well as stills. The Panasonic Lumix G7 delivers excellent image quality, 4K video, and a high resolution electronic viewfinder, all at an impressive price point. Any idea whether the metabones speedbooster (EF to MFT) will work on this? I was pretty much a Lumix fanboy and still love the best lenses they produced. After handling the EM1 and EM5 II, I can no longer abide by the plasticky feel of Lumix. Though the shooting menu of Lumix is still better, IMHO, Lumix has really got to up their game with the new GX8. The White-balance test images are always under exposed, not just with this review, pretty much with all reviews. Is there any chance of correcting this for future reviews. The White-balance test images are always under exposed, not just with this review, pretty much with all reviews. Is there any chance of correcting this for future reviews. Well all MFT cameras are producing great quality now but I agree that the Lumix menus are the best, but I would choose Lumix over Olympus because if nothing else prices. I won't pay A7 prices for MFT, in fact I didn't and am happy with the A7. My G7 order hasn't arrived yet but i am excited about the 4k still modes, the fast AF "propaganda", and the fact that it uses the same engine as the GH4. If all that is true, I can see this replacing my LX100 as a carry around, maybe even the A7 due to its lousy AF performance ! I would like to adapt it to my Canon lenses if anybody knows whether the speedbooster fits well, I read they are only good with the "GH" series, can that be ? ... not sure why i've got a German flag against my name, is that configurable ? Great review ! What a cracking camera.....good handgrip, hi-res EVF, two control wheels, & impressive image quality......superb definition in the Crumpler bag in the WB shots, with lovely smooth tones in the Panasonic compact alongside. Sensible weight for carrying all day.....& the angular styling & 'splatter' finish is refreshingly different.......very desirable !!. The only down-side for me is the price of the systems' ultra wide lenses....desirable but very expensive ! 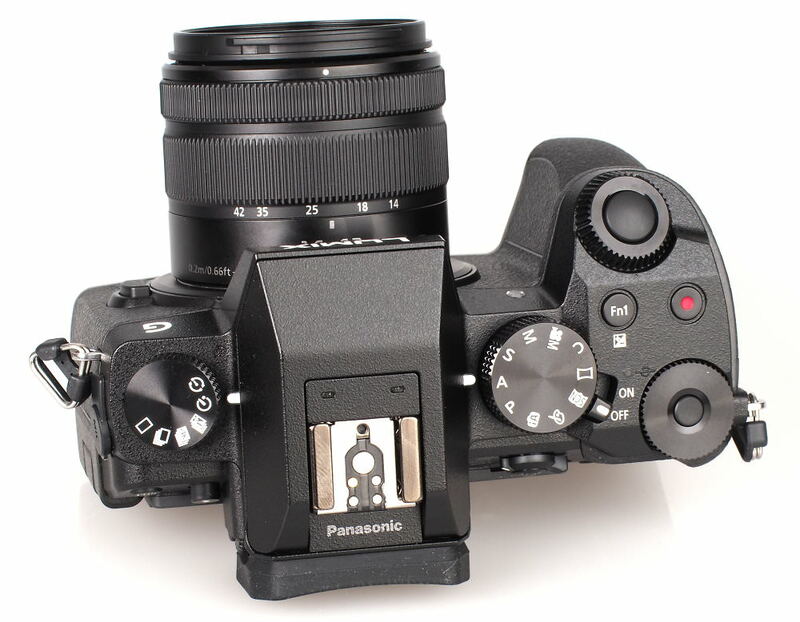 tones in the Panasonic compact alongside. [quote]Any idea whether the metabones speedbooster (EF to MFT) will work on this? [/quote]Yes, it will. MFT is a standard so if the Metabones works on one (as it does), it will work on any. Quote:Any idea whether the metabones speedbooster (EF to MFT) will work on this? Yes, it will. MFT is a standard so if the Metabones works on one (as it does), it will work on any. [quote]The only down-side for me is the price of the systems' ultra wide lenses....desirable but very expensive ! [/quote]I don't think £550 odd for the very high quality 7-14mm Panasonic (14-28 equiv) is bad on Amazon now. Or the 9-18 Olympus for just over £400. I don't think £550 odd for the very high quality 7-14mm Panasonic (14-28 equiv) is bad on Amazon now. Or the 9-18 Olympus for just over £400.
" Or the 9-18 Olympus for just over £400........"
If I could find one at the right price, it's a strong contender !.